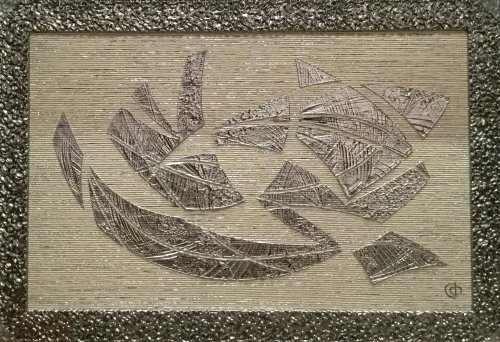 This original artwork has a three dimensional design finished in metallic silver. Lots of textured and movement make this work ingaging and interesting, allowing the viewer to discover different things within it every time it is observed. The back ground is a spectacular silver and ivory striped design, which also has textured and natural qualities. The frame finishes off the work in a spectacular fashion, creating a molten metal look surrounding the design.